I guess am a bit of a paranoid ha... anyway i encrypted my HDD with truecrypt using all printable ASCII characters and the password is 64 characters long. It is quite random, certainly no dictionary words but it is still possible to memorize easily. Can it be brute-forced? The thing is, i know that its supposed to be secure, but isn't there a chance that someone can just guess the password after like 10 attempts? Surely that possibility exists. Sometimes lightning strikes as they say. No security measure is safe on its own, as it may contain bugs/vulnerabilities/etc. It might withstand a single method (e.g. brute-forcing) for circumventing the protection, but there might be a combination of methods that it may not be able to handle. TrueCrypt stores its keys in RAM; on an ordinary personal computer the DRAM will maintain its contents for several seconds after power is cut (or longer if the temperature is lowered). Even if there is some degradation in the memory contents, various algorithms can intelligently recover the keys. This method, known as a cold boot attack (which would apply in particular to a notebook computer obtained while in power-on, suspended, or screen-locked mode), has been successfully used to attack a file system protected by TrueCrypt. Additional reading on "TrueCrypt Security Concerns". If you have all ASCII characters, quite frankly, it is possible still - but highly unlikely. According to http://howsecureismypassword.net/, it would take roughly 314 trigintillion years for a normal desktop computer to crack your password. That's several orders of magnitude greater than the time left in the existence of the Universe. I think you're covered on the brute force front. At work, we deal with hard drive encryption on a daily basis. The truth is, the kind of encryption you have on your drive are probably very sufficient for a home user. I have that same feeling of being paranoid with all my data, and truecrypt satisfies me. However, true encryption for hard drives has to be at the hardware level. Looks for Stonewood drives (Flagstones) on the net. They offer full hardware encryption with a maximum of 5 attempts before locking out, then 5 more before completely destroying the drive according to government standards. There are 95 printable ASCII characters (including space), so there are 9564 possible 64-character passwords. That's 3.75 x 10126, which is over 420 bits of security. In comparison, 128-bits is considered secure from brute forcing for an AES key, and 265-bits is enough to assign a different value to every atom in the visible universe. Assuming your adversary has a botnet of 10 billion computers (1000x larger than the largest known botnet), each of which can check 1 billion passwords per second, the expected time to find your password by brute-force would be 5.87 x 1051 years - that's 45 trillion trillion trillion times the age of the universe. So yes, your password is absolutely secure from brute-forcing. In fact, assuming you are using AES-256, your 64-character password gives you no extra security over a 39-character password, because after that point it would be faster to just brute-force the key. If your password is sufficiently random then, as BlueRaja detailed, you are quite safe from a brute-force attack. However, there is a marginally stronger, and certainly less painful, approach that may be available to you (I say "may" because I'm not sufficiently familiar with TrueCrypt; I use this approach with a LUKS/AES-256 drive). Unlock the drive with a private key instead. Store that key on a USB drive. Lock that key with a passphrase (it doesn't have to be overly complex) and you're effectively in two-factor Nirvana. (Again, I don't know if TrueCrypt supports this, but...) A decent solution to this is to place the boot sector and unencrypted boot loader on a USB drive. Presumably you keep this on your person. (For added security, use a USB drive with hardware encryption). The right question is what risk are you trying to mitigate and is HD encryption sufficient to mitigate to an acceptable level. If you are storing super top-secret govt plan plans to take over the world, then you might need more or less security than if you are protecting your personal financial data (or pr0n stash). Not everyone can do it (most people can't), but there are always people out there who can do a bit more than the avarage computer user. You're far more at risk from a virus on your computer that accesses the unlocked drive or peeks at "in flight" cleartext data. Not the answer you're looking for? Browse other questions tagged windows hard-drive encryption truecrypt or ask your own question. 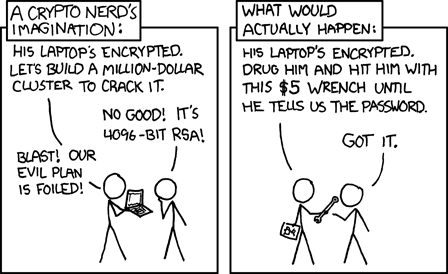 Security-wise, is encrypting the partition containing the data as safe as encrypting the whole HDD? hdd encryption before or after usage? Is encrypted but online USB PenDrive safe from ransomware attack?